I have always loved falafel — I mean, it’s hard not to love the crunchy deep fried goodness, right? You know what isn’t hard to do? Making a healthy and delicious baked falafel with homemade tahini sauce, that’s what. First off, let me back up. If you don’t know what a falafel is, it’s a spiced vegetarian food (kind of like a vegetarian meatball) and it’s got a lot of dimension thanks to the fresh coriander and parsley and the dried spices, coriander and cumin. Traditionally they are fried, which makes them delicious but also maybe not the healthiest. 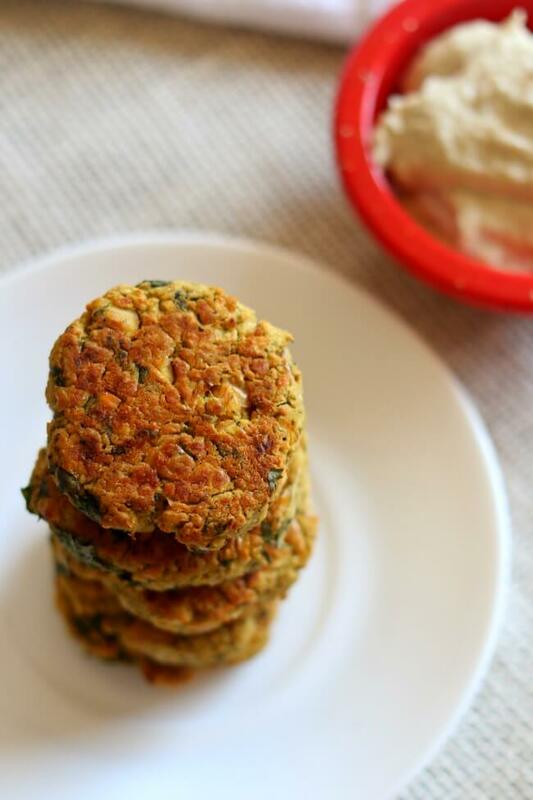 These baked falafels are perfect for serving the day that you make them or you can store them in the fridge in an airtight container for up to a week. You can even freeze them if you’d like. I like to pop one into the microwave for 10-15 seconds when I’m feeling hungry. They make a quick snack that is filled with protein. You can also make them into a meal by serving them in a pita pocket. 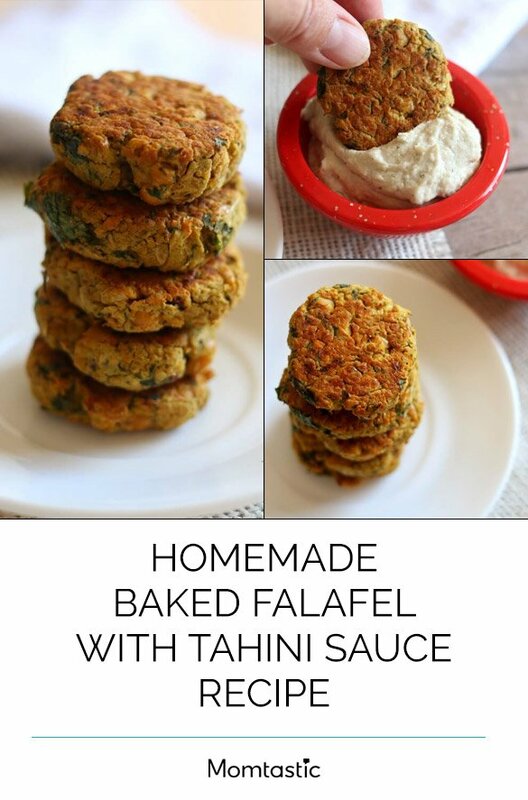 Serve these homemade baked falafels in a pita pocket with tomato, onion, lettuce and homemade tahini sauce or even a tzatziki sauce. 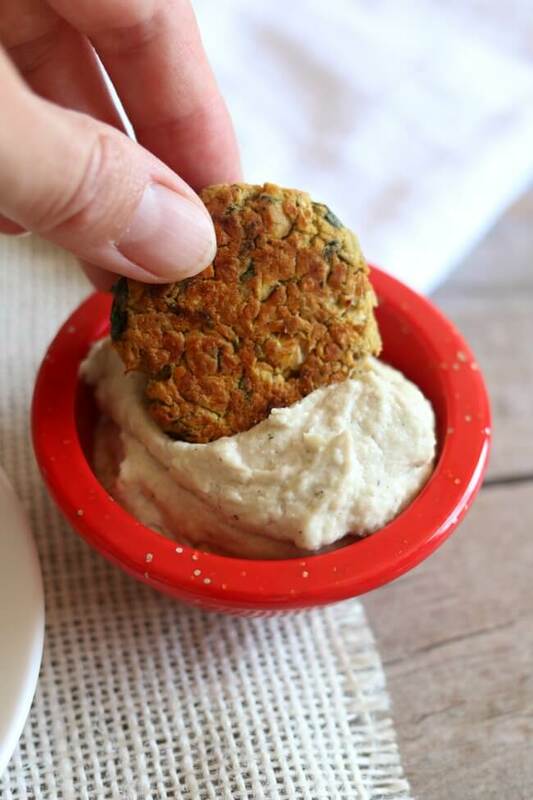 See my easy to follow recipe for baked falafel with tahini sauce below and then thank me later! It's so simple and delish. Step 1: Combine the chickpeas, onion, garlic, parsley, coriander, olive oil, lemon juice, cumin, coriander, red pepper and salt in a food processor. Pulse 10-12 times. The mixture will be broken down but still a little chunky. Step 2: Sprinkle in the baking soda and the flour. Pulse a few more times. The mixture will not be totally smooth. 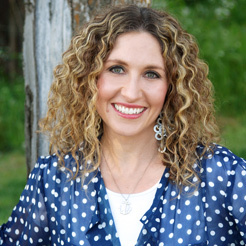 This is what gives it texture. Step 3: Form the dough into patties -- use one tablespoon at a time of the mixture and roll it into a ball and then press it down with 2 fingers to form a patty. 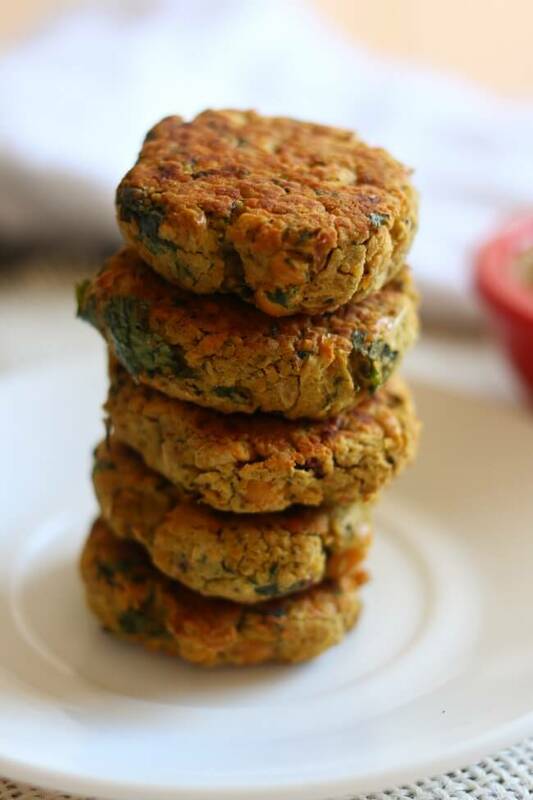 Place the patties on a plate and refrigerate for one hour. Step 4: Preheat your oven to 400° F. Place the patties on a cookie sheet that has been sprayed with non-stick cooking spray. They should all fit on one sheet. Step 5: Bake them for 20 minutes and then flip them carefully and bake for another 10 minutes, until brown. Step 6: While the falafel is baking prepare the tahini. Add sesame seeds to a large saucepan over medium-low heat and toast, stirring constantly until the seeds become fragrant and very lightly coloured, 3 to 5 minutes. Transfer toasted seeds to a bowl and let them cool. Step 7: Add sesame seeds to a food processor then process until a crumbly paste forms, about 1 minute. Add 3 tablespoons of the oil then process for 2 to 3 minutes more, stopping to scrape the bottom and sides of the food processor a couple times. Check the consistency. It should be smooth, not gritty and should be pourable. You may need to process for another minute or add the additional tablespoon of oil. Taste the tahini for seasoning then add salt to taste. Process 5 to 10 seconds to mix it in. 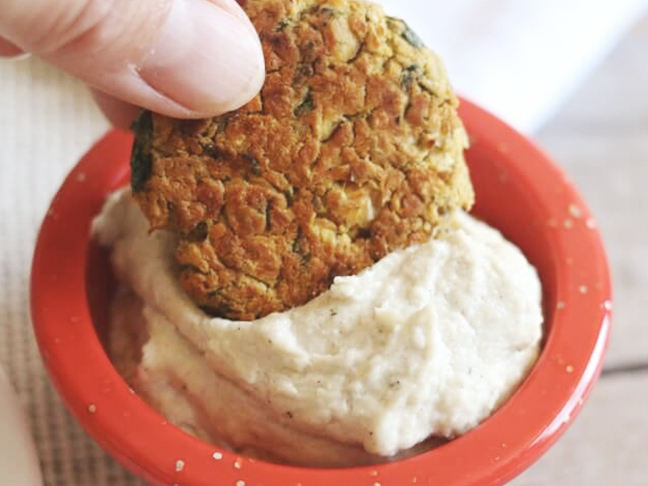 Step 8: Serve the falafels with the tahini and enjoy!